All her life, Sydney Sage has been taught to never question the Alchemists’ teachings, but recent events have her doing just that. She sets out in search of the mysterious Marcus Finch, a former Alchemist who’s gone rogue. In tracking him down, Sydney hopes to discover what the Alchemists are really up to because she strongly suspects that they’re withholding important information from her. Meanwhile, Sydney also finds herself involved in another search of a different kind. Someone is targeting young women who haven’t tapped into their magical abilities yet and draining both their youth and their powers. As much as Sydney wants to help find the culprit, it means using her own magic, yet another thing that goes against everything she believes in as an Alchemist. Sydney realizes that she has reached a crossroads in her life, and she must decide whether to continue on the Alchemists’ path or to part ways with them once and for all. The previous Bloodlines novel, The Golden Lily, saw straitlaced, logical Alchemist Sydney Sage allowing her heart to have more say in her decisions. 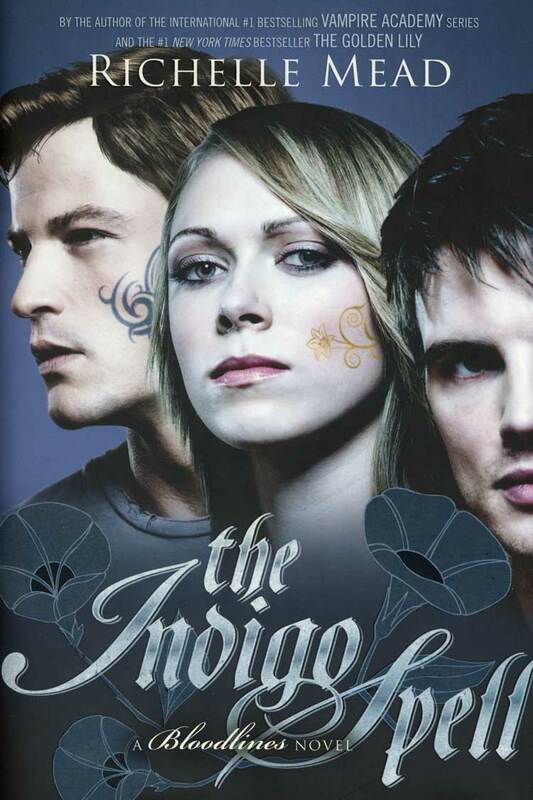 In The Indigo Spell, Sydney, fed up with the Alchemists’ subterfuge, ditches blind loyalty and is determined to uncover what secrets the organization she’s dedicated her life to is hiding. The new, rebellious Sydney even gets busted for breaking curfew! I’ve liked Sydney as a protagonist since the first Bloodlines book, but rebel Sydney is definitely my favorite so far. Richelle Mead has done such a great job with Sydney’s character progression, having her grow into someone who now questions authority and puts those she cares about before duty, all while retaining the qualities that make Sydney, well . . . Sydney. She’s still very uncomfortable with using the magical powers she didn’t even know she possessed until recently. They stand in complete opposition to Alchemist beliefs. The thought of what would happen if the Alchemists found out about her magic use weighs heavily on Sydney’s mind, as does her muddle of feelings towards one Adrian Ivashkov. If dabbling in magic is a big Alchemist no-no, then a potential Alchemist/vampire romance is a super big no-no. But realizing that the Alchemists may not be the models of integrity they portray themselves as really pushes Sydney to a breaking point. Her choices, like helping her history teacher, Ms. Terwilliger, stop the witch who’s stealing others’ powers, may flout Alchemist rules, but they stem from good intentions. The Alchemists, on the other hand, claim to be acting in the name of good, but Sydney’s faith in them has been shaken, perhaps permanently. A huge factor in Sydney’s changing perspective on life has, of course, been Adrian. His impulsiveness and carpe diem outlook have been good for her, and her determination and focus have been a good influence on him. These two truly complement each other, something that I didn’t predict happening when I began reading the series. Adrian himself has come a long way character-wise. Don’t worry—he’s still Adrian and still spouting clever Adrian-isms, but he’s also matured a lot. He tells Sydney that he’s learned from the mistakes he made trying to win Rose’s heart, and he’s not going to repeat them with Sydney. Knowing how conflicted her emotions are, he gives her space, but he’s ready to jump to her side at a moment’s notice to protect her. Just when I thought Adrian couldn’t possibly melt my heart any further . . . . In the days leading up to the release of The Indigo Spell, the name Marcus Finch seemed to be everywhere. I expected this former Alchemist to play a major role in the book, but in the end, I found his importance overhyped. I also found him rather overconfident and of the mindset that he can smile his way through any situation. I didn’t fall for his charm, and fortunately, neither does Sydney. I doubt we’ve seen the last of Mr. Finch, so it’s likely he’ll have additional chances to impress me more than he did here. Although I really enjoyed The Indigo Spell, I felt that it didn’t quite measure up to either Bloodlines or The Golden Lily. There was a rather detailed recap of how Sydney, Jill, and Eddie wound up in Palm Springs; three books into the series, I think I have a pretty good handle on that backstory. The resolution of Sydney’s two missions in this book, digging up dirt on the Alchemists and tracking down the power-robbing witch, seemed a little anticlimactic to me, too. Maybe that’s because I’ve grown accustomed to Richelle Mead’s bombshell endings. She still leaves you plenty to think about in the conclusion of The Indigo Spell, though, while you await the release of the fourth book, The Fiery Heart, later this year. I’ve become as invested in this series as I was in its parent, Vampire Academy. Though I loved the first two Bloodlines books a smidge more than this one, The Indigo Spell was still a very fun read. I would join Alpha Yam Ergo in a heartbeat! I felt the same way about the background overload, but still enjoyed The Indigo Spell a lot. I'm in with Alpha Yam Ergo, though I suspect Sydney's going to find the very long - very female - pledge list exasperating! So true, lol! She seemed a bit flustered upon hearing about AYE's "nautical origins," too! I hope you enjoy it, and I can't wait to hear what you think of it!